Blogs are a medium to express thoughts, feelings, and opinions. Once published, blog articles potentially become persistent and can be read by non-intended audiences, causing hurt feelings and other troubles. In part these problems are due to the lack of access control in blogs. We propose an access control framework for group blogs. Compared to the typical access control in blogging tools, our system differs in a few aspects. First, the system enables bloggers to grant different access privileges to different audiences over a single blog article. That is, it associates access privileges to people rather than to artifacts (e.g., articles, blogs). 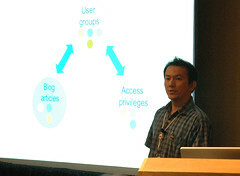 Second, the system allows a blogger to create a collaborative space with other bloggers, for example by allowing others to edit his or her articles. Third, the management of access control is integrated with the process of writing and editing blog articles, facilitating the main workflow of the user. We conducted a usability study to evaluate our system and get constructive feedback from users. In this article, we present the proposed access control system, the results of the study, and analysis of the results.